n 1998, Hyundai and a group of New England-area dealers joined the fight against pediatric cancer by supporting a local initiative to support the Jimmy Fund at the Dana-Farber Cancer Institute. 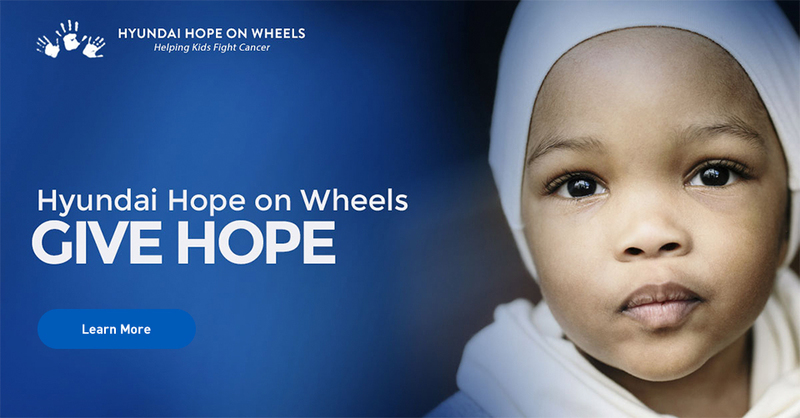 This activity quickly grew nationwide and soon became Hyundai Hope On Wheels (HHOW). HHOW is a 501(c)(3) nonprofit organization, that is committed to helping kids fight cancer. The goals of the organization are to fund research and to create awareness for childhood cancer. Hyundai Motor America and its more than 830 dealers and customers support the cause with a donation from every new vehicle sold. In 2017, HHOW surpasses $130 million in life-time donations to pediatric cancer research in the United States. As recent as the 1950's, a diagnosis of pediatric cancer has an almost always certain outcome and very few children survived. Due to advancements technology, improvements in data analysis, and research collaboration, today nearly 80% of pediatric cancers can be cured. The survival rate, while good, does not tell the entire story. Many forms of pediatric cancer remain high risk for children and have shown little progress. And the harmful side effect for far too many kids, take a severe toll on their bodies. The goal of research is to improve cures and to improve care for children diagnosed with the disease. You may be shocked to discover that less than 4% of federal research funding for cancer is designated for pediatrics. Without necessary funding, potentially life-saving research and new treatment therapies will go undone. We believe that these young childhood-cancer fighters deserve a chance, and HHOW is funding research in pursuit of a cure. Each year HHOW visits children's hospitals across the U.S. to donate funds and raise awareness. During the event, we host our signature "Handprint Ceremony" which captures each child's handprint in paint. These handprints are placed on Hyundai cars that travel across the country to build colorful awareness of the program. Because there is nothing more personal than a handprint, each is distinctive in its own way. Whether it's completing a round of chemo, celebrating a beautiful new head of hair or receiving a clean bill of health, one child's milestone can be another's symbol of hope. And these handprints serve as our symbol. It's all about the kids. No child ever deserves to hear the words 'you have cancer.' HHOW is dedicated to supporting pediatric cancer research that finds innovative approaches, creates discovery, and improves care for children fight cancer. Working together with the physician-research community, we seek to find a day when no child loses his/her fight with cancer again. 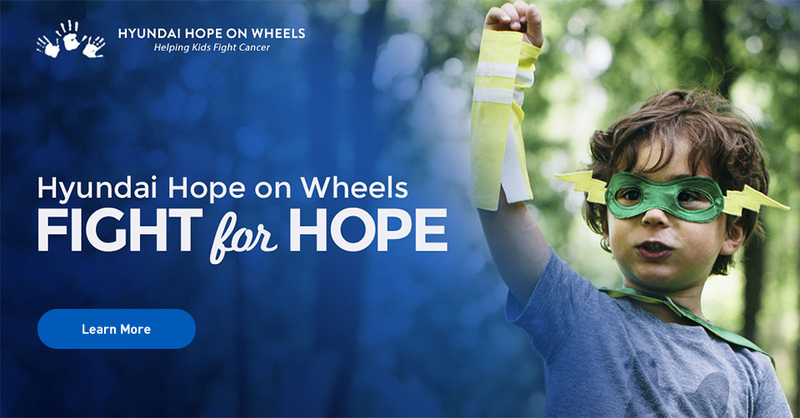 In 2017, Hyundai Hope On Wheels will reach $130 million in donations to pediatric cancer research. In the years to come, we will continue to award additional grant dollars and to create greater awareness for the disease. And, we invite you to join our journey and help spread the word through your direct participation, personal involvement and social media activities to increase awareness.